The Saccopteryx project - batlabs Jimdo-Page! Why do mammals aggregate in groups? What is the benefit of group living in relation to the disadvantages, such as increased pathogen transmission risk? Using bats as a model, we try to shed light on the mechanism that promote bat sociality. Also, we are interested in how mammals choose their mating partner? What specific male traits do females use as a criteria for their mate choice? And why are certain male traits an honest signal for mate choice decisions? In this long-term project, we work to understand the proximate and ultimate factors that shape the social and mating system of the greater sac-winged bats (Saccopteryx bilineata); a 7-g bat of lowland rainforests in Latin America. This species lives in a so-called harem-polygynous social system. In colonies of S. bilineata, harem males try to monopolize groups of females against male intruders (see left picture for a typical harem with 1 male and 3 females). Based on paternity analysis, we found out that harem males sire only about 30% of the offspring in their harem group. So, why do males defend harem groups, if reproductive success is not monopolized? Most likely, males do not necessarily defend females, but rather sites to court females. By monopolizing such arenas, males are able to display in front of more females than males without an arena. Indeed, harem males sire more offspring than non-harem males, when females are also considered that roost outside of a male's arena. Males are also smaller than females and physically inferior during direct interactions. Therefore, male S. bilineata can not coerce copulations with females, instead they strongly depend on female cooperation. Obviously, female choice is highly important in this mating system. This may also explain, why males have an elaborate courtship display. The most conspicous display of males is a hovering flight performed in front of females (left picture). 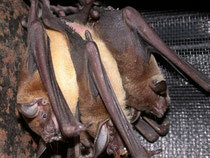 During these displays, males fan volatiles from their wing sacs towards resting females. Wing sacs are non-secretory pouches located in the front wing membrane in which males store their perfume. Since the wing pouches of male sac-winged bat are not glands, males have to tranfer odoriferous liquids from somewhere else into the pouches. Colony males do this each day at about the same time in the afternoon. 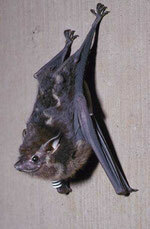 First, they take up urine and clean their wing pouches for up to 15 minutes. Then, they fill liquids from various body regions (e.g. genital, gular and mandibular region) into their pouches. By doing this, males create their own perfume that is later displayed in front of females.Currently, we work to understand how mate quality is encoded in the odour profiles of males. For this purpose, we look at the immune competence and the genes of the major histocompatibility complex (MHC) of males. Why do mammals live in groups? 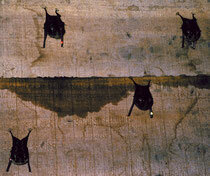 In particular, what is the benefit of group-living for bats? One major advantage of group living may be thermoregulation when bats form clusters (see picture).. We looked into another potential benefit of group living: namely group foraging. Noctilio albiventris, the lesser bulldog bat, of Central America is catching swarming insects that temporarily emerge over water bodies. We tested the idea that Noctilio is foraging in groups so that they can listen to the echolocation calls of conspecifics. This behaviour is called eavesdropping. Since echolocation calls of successfully foraging bats change in repitition rate and frequency, a bat may be able to learn about food sources by eavesdropping on others. Indeed, we found that N. albiventris is atttracted to the echolocation calls of conspecifics in playback experiments (Dechmann et al. 2009 PRSL). But how do group members decide on which member to accept and which to repel from a group? We speculated that group members recognize each other by a group-specific odour that evaporates from the axial gland at the base of their wings. Using GC-MS, we currently test if females have group-specific odours.